Humans Not Robots - support and resources for SEN / SpLD: Millionaire status! 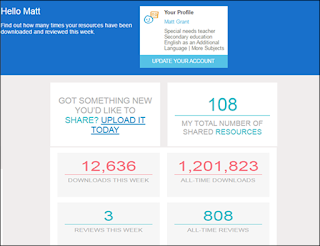 I received an email on Friday just gone which took me by surprise - it turns out my resources on TES have now reached over a million downloads. Naturally, I have since wondered, 'Hmmm... if I just had a pound for every download...' - or for that matter, even a penny for every download! This news of a million downloads certainly makes the days of teachers using the TES forums to get in touch and then posting each other envelopes of resources - as it was back in 2004 / 2005 when I first started sharing resources - feel like a lifetime ago! Although I haven't updated this blog in terms of actual posts for some time, I do continue to share resources. I've also tended to make more use of my Facebook page to share articles on education I find interesting - please do look it up and give it a 'like'. I also appreciate the encouraging emails I receive from teachers out there - it is good to know that others are benefitting from my resources. More generally, I think the share and share-alike culture that has developed amongst teachers - still largely non-commercial and altruistic - is something our profession should be proud of.